Mazda 2 and 6 Tamura offers | What Car? 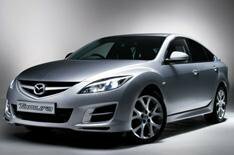 Mazda has launched two special editions of its 2 and 6 models. The Mazda 2 Tamura is based on the TS2 trim, which is powered by the 85bhp 1.3-litre engine. It has bigger bumpers, a special grille, side skirts and a rear spoiler, 16-inch alloy wheels and a choice of four metallic or mica paint colours. Prices start at 10,275 for the three-door model and 10,775 for the five door around 400 more than the standard car. The Mazda 6 Tamura is based on the 145bhp 2.0 TS five-door hatchback and adds tinted glass, 18-inch alloy wheels and alloy pedals. There are four metallic or mica paint choices. Prices start from 16,695 around 300 more than the standard car. Both the Mazda 2 and 6 Tamuras also come with a year's free insurance for drivers aged over 21 and a finance deal charged at 6.9% APR with a 10% deposit. Mazda 6 Tamura buyers also get three years of free servicing. Buyers are reminded that they should still haggle hard, looking for a discount of around 10%.